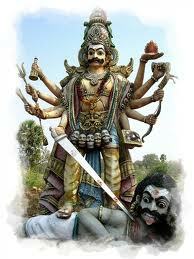 Oppilatha Amman meaning the Matchless Goddess has a temple in Ariyalur. This temple is in Ariyalur itself. There is a very interesting story of how she came about to have a temple there. Long time back it seems on Bangale seller was trying to sell bangles in the streets of Ariyalur. Then he saw a very pretty girl standing in the middle of the street. She called him and requested to give him lot of bangles. When the bangle seller hesitated , that little girl told him, “Are you hesitating because you think I will not give you any money? In the next street there is a very big house. Go to the owner of the house and tell him that you supplied bangles to a matchless girl. He will give you ample money. “. The bangle seller was impressed, requested her to sit on a stone and made her wear lots and lots of bangles,. The girl happily went away. The bangle seller went to the next street and he saw a very big house there. People informed him that , the house belonged to the king who was residing in that house. Boldly the bangle seller entered the house and asked the security people for money to his bangles. They told him that there was no little girl in the house and thrashed him. Then the bangle seller told, “I was deceived , she told that her name starts with “Matchless”. Then the king whose clan name was “Matchless” understood that the girl was their clan goddess. He profusely apologized to the Bangle seller and presented him with lot of money. The king immediately got a temple built in the place where on the stone she sat to wear the bangles. That temple does not have a roof and is below a huge banyan tree. That temple is called the temple of the Matchless Goddess. Along with her inside the sanctum are the seven sacred maidens(Saptha Kanniyargal) Devotees believe that worshipping this Goddess would make them get all that they wish. They believe that if we prepare Pongal, offer it to her and worship her, they would get all sort of wealth. In a near by temple are Lord Ganesa and Lord Subrahmanya. Outside the temple are Muniyappasami, Ayyanar, and Karuppasami. The animal sacrifices are done in front of these Gods . There are special worship to the Goddess in the months of Adi, Chithirai and Margazhy. The temple is open from 7.30 Am to 11.30 Am and between 5.30 Pm and 8.30 PM. People take Turtmeric, Kumkum powder and bangles as offering to this Goddess. A visit to this temple brings cheers in life. The temple is in Ariyalur.